Party 2 Go rates are fair, and consistent, we take into account only the equipment used and the length of the event. This is part of our commitment to professional integrity. Our pricing is not a secret because it is not subjective — we do not engage in “price gouging” our customers based on what we think they can afford to pay. Weddings make up 95% of the events we do, and we put a tremendous amount of time and resources into making sure each wedding is a success. 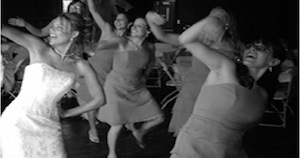 We only perform for one wedding per day, and are meticulous about their planning and preparation. The time we’re willing to spend meeting with and communicating with our clients is limitless. “How do you set prices?” Our view is that offering a range of pricing also means offering a range of quality — something we would never be willing to do. We can’t be half as good for half the price, or twice as good for twice the price. We will simply do our very best for each of our clients for a fair price, therefore we stand by our fair and consistent pricing. Now with the exciting “Dancing On A Cloud” Low Lying fog effect. Your special dance will come out spectacular, your guests won’t believe their eyes. Call Now to get Dancing On a Cloud added to your wedding. In addition to the lights we bring, moving heads, Moon flowers, 20 inch mirror balls and more. We also offer uplighting for around the room. These are LED par can lights on the floor pointed toward the ceiling in front of walls and or columns. This can help change the atmosphere of any room to obtain the effect you are looking to have at your event. These lights are LED which makes them have the ability to be practically any color you desire. Lets talk about how Party To Go can help make your event one that your guest well remember for the rest of their lives. Party 2 Go also offers custom GOBOs. Gobos (which stands for goes before optics) are patterns, images, words, etc., that are projected onto a wall or other surface from a projector or light fixture or between the light and the surface. Now you can have your monogram or names elegantly projected on a wall for your once in a life time day. The possibilities are nearly endless.